The first time you fire this game up, you’re greeted with a full motion video highlight reel of big hits and big goals from the NHL that gets you psyched to play some hockey. Unfortunately the game that follows will leave you feeling unfulfilled. All-Star Hockey allows you to play a single game, a full season with a length of the player’s choice, a playoff season, or a world tournament featuring 16 national teams, and the game has both NHL and NHLPA licenses. The game settings are fully customizable, as one would expect. Everything needed for a proper hockey video game s present, but where the game fails to deliver is in the actual gameplay itself. The slow skating makes me feel like I’m playing an early 16-bit hockey game, only the animation is choppier and the frame rate is worse. The game tracks stats, but they can only be viewed after a match is over, which is annoying. The obligatory fighting is terrible. Most hockey game developers don’t do a proper job of programming a decent fighting experience, so just leave it out of the game! The crowd noise is a bit too quiet, but is realistic as the crowd reacts to the action on the ice. The game does have a stadium announcer which helps add some realism, but the announcer sounds like a text-to-speech program and mispronounces a lot of the players’ names. Also, by this time EA’s NHL 98 had play-by-play announcing and color commentary which makes this game look even more primitive. Unfortunately, if you were a hockey fan and a Saturn owner back in 1998, you didn’t have much choice, as Electronic Arts bailed on the Saturn after NHL 98. 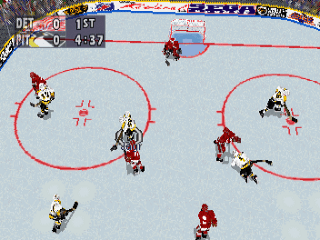 Perhaps thankfully, this was the last hockey game released for the Sega Saturn console. While far from unplayable, I found the game to be simply unenjoyable. Buy NHL All-Star Hockey ’98 on GameGavel or Amazon. Tagged 1997, All-Star Hockey '98, Hockey, Review, Saturn, sega, Sports. Bookmark the permalink.